Numerology is the science of divination by numbers. A numerology compatibility analysis chart may be used to determine compatibility for personal or business relations or to determine the success of an enterprise based upon the numbers derived from dates and names associated with it. Numbers rule our lives! Right from the time life starts in a womb, its progress starts getting recorded in terms of numbers. We encounter numbers in every walk of life. We can't escape numbers even when we die - the day of our demise would be recorded by our families and friends in numeric terms, i.e. a date! Well, there is more to numbers than mere involvement in our day-to-day activities - numbers can be used to predict the outcome of an action, an alliance and even to explain the reasons behind unexplained occurrences. This is what numerology is all about! Numerology is a pseudoscience which is used for divination, similar to astrology. This science works on the principle of the inter-relation between different numbers based upon their individual meanings and inferential associations. Numerology charts are devices which tell us about such meanings and give us a pictorial comparison of different inter-numeric combination. These charts are used to compare and determine chances of personal and other successes derived from interpretations based upon different parameters of numerological compatibility such as birth date, name, etc. Numerology charts which are popular in the modern day are based upon the Pythagorean system and display the numbers from 1 to 9, mapping the inter-relation of one number with each of the remaining to determine compatibility or the lack of it. Numbers are also assigned to all alphabets from A through Z to arrive at numerological reading of names and words. Different schools of numerology follow different numerology charts and systems. For instance, Chinese numerology follows a different system of interpretation and value attribution from, say Hebrew numerology or Indian numerology. 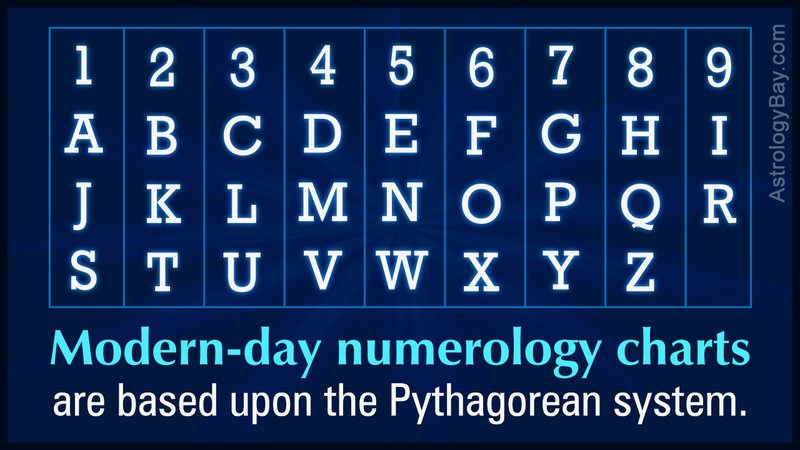 For the sake of simplicity, let us take a look at the two most popular numerology systems prevalent for assigning numeric values to alphabets. The Chaldean chart follows a value system ranging from 1 to 8, omitting 9. The Pythagorean system is the most popular among the two and is generally used to draw numerology charts to measure compatibility. So what is a numerology chart and how is numerological compatibility determined from it? Let's find out! Besides these, there exist master numbers in numerology which are double-digit numbers and are considered more vibrant than all single digit numbers. These numbers are believed to denote psychic and alchemical potential. The four master numbers are 11, 22, 33 and 44. Based on this information, you can derive compatibility on the basis of names and numbers. Let me illustrate this with a couple of examples. Judging from the numerological compatibility chart above, two 7s don't go very well with each other. Hence, name numerology calculations show that chances of compatibility don't seem very bright. 2 and 8 ... well, well, well, looks like one of the most compatible combinations here! There are many free compatibility charts available online on various numerology websites which calculate numerological compatibility by asking you to either enter two names or two dates of birth! Numerology is a fun way to fall in love with numbers and once you get a hang of it, trust me, you'll get hooked! Have fun with friends by comparing each other's names and birthdays using this numerology chart and fascinate them with your divination prowess! Besides the fun part, numerology also offers answers to questions like "Why does it always happen to me?" or "Why can't I ever get along with X-Y-Z?". The numbers may have the answers to the mysteries that always elude you!